One of the most requested features, and probably the highest on our wish list, is now a reality in StormWatch+. Previously, users were required to manually enter the locations they wished to receive alerts for, whether by address or the GPS on their device. These static locations could be changed as often as the user wished, but they never changed on their own. That all changes with the addition of StormWatch+ EnRoute! Though static location capability is maintained, EnRoute brings dynamic alerting to StormWatch+ for the first time. 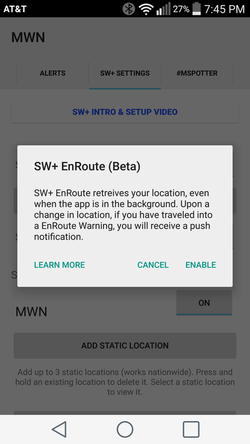 In a nutshell, EnRoute uses your device's on-board location services, including GPS, to consistently update your location as you travel, sending an alert if you move into a warned area. The app does not even need to be running in the foreground for EnRoute to work! The user will even have the option to set how their location services are used - either preserving battery life or sacrificing some battery life for a very precise alerting service. The screenshots to the right are from the MemphisWeather.net app with StormWatch+ and EnRoute, showing the splash screen that is displayed when activating EnRoute, as well as the setting to control your battery life. 1. What is the difference between "Better Battery Life" and "More Precise"? 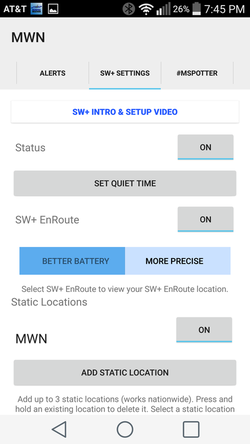 "Better Battery Life" will provide alert accuracy to within ~1.5 miles (often much more accurate in urban areas with dense cell tower coverage), while "More Precision" will provide alert accuracy to at least thirty (30) feet. 2. What alerts are sent via StormWatch+ EnRoute? At this time, only TORNADO WARNINGS, SEVERE THUNDERSTORM WARNINGS, and FLASH FLOOD WARNINGS are delivered via EnRoute. If you are traveling and you plan to stay the night somewhere, we recommend setting a static location in order to receive other watches and warnings that might be issued. 3. Will I be alerted when I leave a previously-warned area? Not always. While it is possible to determine when a user ENTERS a warned area while traveling, it is much more difficult to determine when he/she LEAVES the warned area. Notification will not be provided, nor will previously-received warnings be removed from the app, when the user exits a warning. (Alerts will drop off the device at their original expiration time though.) If a user's location has not changed after receiving an EnRoute alert, updates to the original warning (continuations, cancellations, etc.) will be sent, however.